What have I Learnt from 20 years in the Design and Print Industry? I have just celebrated 20 years in the Design and Print Industry, my 20th year at Remous Print, which solicited many congratulations as well as several – ‘blimey that’s must be a tough business to be in’ conversations. Which got me thinking, what have I learnt from the last 20 years in print? How has it changed and what will the next 20 years hold for Design, Print and Finishing? Not wishing to get too philosophical – I can focus on the facts, Print and creative has changed a massive amount in that time, gone are the days of 3-4 week lead times, they are now 3-4 days (sometimes hours!) Print in many ways has become commoditised and has become a product rather than a service, with online printers standardising printed products to enable ‘order and forget’ style working practices which has seen many traditional print companies stood in shock wondering where it all went wrong. 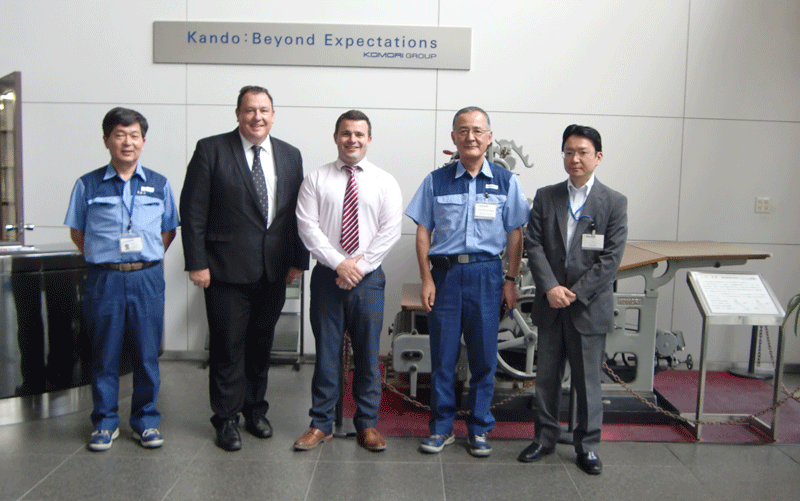 A visit to the Komori Manufacturing Plant, Tsukuba, Japan. Fast forward 20 years – our folder operator now also can run the guillotine, stitch line, box gluer, creasing machine and may work on all of these in the course of an 8 hour day. After folding I spent 2 years on a guillotine then on to die cutting, printing, platemaking and more – after 10 years I had experience in every part of the print process and could operate every machine in the factory – something which has been invaluable in the last 10 years from production management to sales development – that experience is something that helps clients, when we support and fulfil their marketing planning. This theme of multitasking is prevalent in all our working lives, so is the ‘on demand’ life style, which is now a dominant feature in print. Something that wasn’t there 20 years ago, in 1998 clients would ask us how long it would take to produce a job, looking back lead times were generous (though did not seem it at the time) where as now there is a presupposition that print will be instant in a similar way to how we buy clothes, food etc online. This paradigm shift is great for clients and has seen print companies such as ours invest constantly in new technology to speed up the processes and reduce the lead times, 20 years in I wonder how we can do things any faster, but for sure something will come along. At Remous Print we have what we consider the best technology available, which leaves little room for improvement in terms of the quality and lead time – so what do we do next? Look inwardly. We are working on a Kaizen style of evolution to improve quality management (‘RQC’ or Remous Quality Control) and reduce bottlenecks in production, this engages all our staff in teams and with everyone’s involvement we are seeing great ideas and improvements to our production processes. Would this of happened 20 years ago in a print shop? I doubt it! So to go back to the question, What 20 years in the print industry has taught me? I have learnt that the pressure of production will always be client driven, it is an exciting industry (contrary to popular belief) at the forefront of technology. The pursuit of which has taken me around the world, print is a truly worldwide business with everyone looking to achieve the same goal, great quality at a sustainable price in the shortest time possible. With the changes in the GDPR regulation, there is a massive opportunity for marketeers out there to capitalise on direct mail, personalised print and tangible marketing, here is to the next 20 years!